When you choose to purchase a dog from a certified breeder of the Australian Labradoodle Club of America (ALCA), you are not just buying a dog. You are choosing a bloodline with pristine health quality and as well as the consistent, pleasing demeanor expected in this breed. The ALCA has set high standards of health for any dogs registered as a breeder. Parent dogs must be born from dogs registered within the club. This means each generation of doodle has passed required testing rigors. Sweet Carolina Labradoodles uses experienced doctors who are knowledgeable and caring. We work with them to ensure that first the doodle’s health is nearly perfect. Once this is established, we then work closely with our vets to breed healthy and loving puppies. We want to ensure that our doodle pups will serve their families well, whether as service animals or as companions. Testing requirements have grown as the club has grown. These requirements became necessary for quality breeding programs to avoid genetic defects that appear in various pure-breed programs. Problems with pure-bred animals happen due to constant selective breeding. Breeders attempt to maintain certain qualities for which breeds are known. But these standards can lead to health defects, in many cases, that occur far too commonly. This fact alone is an excellent reason to choose an Australian Labradoodle. This breed is known for its beauty, intelligence, and friendly demeanor. But our breeding practices do not lend themselves to genetic defects. In fact, with the testing, we are doing our best to ensure genetic problems do not enter the Australian Labradoodle equation. Eye testing is done to ensure that heritable eye diseases in dogs can be completely avoided. When you purchase a registered Australian Labradoodle, you purchase confidence that your pup will not experience avoidable eye problems. A CERF (Canine Eye Registration Foundation) test is an eye screening exam done by veterinary ophthalmologists. These specialists are board certified by the American College of Veterinary Ophthalmologists (AVCO). 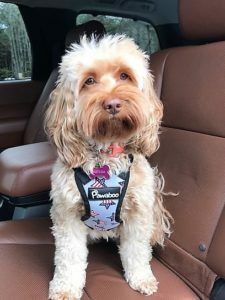 Sweet Carolina Labradoodles travels two hours to the closest specialists available in Charlotte, NC. The procedure involves a complete examination of the eye. The dog’s pupils are dilated with eye drops. The examiner uses a penlight to look for any key abnormalities. The specialists use a slit lamp bio-microscope to check for diminutive anomalies in the lens, in the cornea, and in the anterior chamber. During this part of the exam anomalies such as distichia, cataracts, vitreal degenerations, and corneal dystrophy can be noticed. The retina is examined using an ophthalmoscope. This instrument provides a view of all the parts of the retina. Issues like Progressive Retinal Atrophy, Retinal Dysplasia, optic nerve hypoplasia, and choroidal hypoplasia can be recognized during this time. Large breed dogs are most likely to develop joint dysplasia issues. This includes the Labrador Retriever. Thus, the ACLA requires this testing to ensure we do not breed animals with such defects. Joint dysplasia means the ball of the joint and/or the socket is malformed, causing separation of the two bones of the joint. In most cases with dysplasia, the socket is not deep enough for the ball to fit tightly into place. In a dog with healthy hips, the ball at the top of the joint fits perfectly into the socket. In animals with dysplasia, an abnormal fit causes the bones to separate. This separation can handicap the animal. The Orthopedic Foundation for Animals (OFA) remains the standard for testing for joint dysplasia. X-rays can be taken by any licensed veterinarian and sent to the OFA for review. In fact, our hometown veterinarians have recently begun this journey with us in testing our breeders with the OFA. We love the Charlotte veterinary hospital who we have used previously. We plan to continue to work with them when needed. But having our local veterinarian help us with testing now saves us from spending an entire day two hours from home waiting on testing. The x-rays for dysplasia do require sedation, so our sweet doodles go without food and water the night before the tests. They remain with the veterinarian several hours to complete procedure and to awaken from the sedative. Although they provide a few giggles after waking up, they bounce back to their normal selves quickly. To obtain certification, here at Sweet Carolina Labradoodles we schedule our pups appointments after they turn ten months old. This age ensures they are practically developed and will test accurately. We travel with our dogs buckled up in the back seat for safety. They love to travel. Because we live in the country, we plan a few weeks in advance to do the eye testing in Charlotte as well as the OFA testing at the local vet in the same week. This way we can send both results off and register our labradoodles with the ACLA. 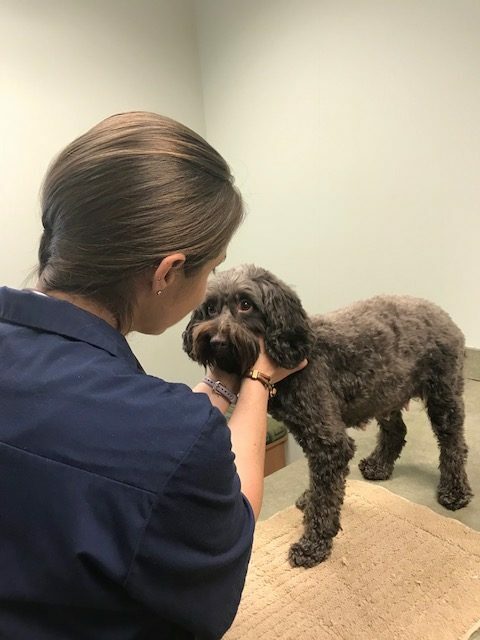 The first test for hip and elbow dysplasia is a procedure requiring several hours as the doodles are given light anesthesia to have a thorough examination. After our labradoodle wakes, we then visit a canine eye specialist for a detailed examination of the eye. The Labradoodle is then registered with the Canine Eye Registration Foundation (CERF). Upon receipt of satisfactory results, we send the paperwork to the ACLA, pay the registration fee, and our new doodle breeder is official! Our club’s health requirements ensure not only the health of our puppies but also that our adoptive families can count on gaining a quality pet to enjoy for years to come.